(VEN) - A workshop on building trade development program in remote, mountainous and island regions jointly organized by the Ministry of Industry and Trade (MOIT) and Quang Ngai People's Committee with the support from the European Trade Policy and Investment Support Project (EU-MUTRAP) was recently held in the central province of Quang Ngai. The workshop targeted to collect opinions for a draft program on developing trade in remote, mountainous and island regions approved by the prime minister. Deputy Minister of Industry and Trade Nguyen Cam Tu together with the local leader and representatives from the provincial sectors and enterprises attended the workshop. Deputy Minister of Industry and Trade Nguyen Cam Tu stressed that over the past years, the Party and State has adopted important policies and invested considerable resources in the mountainous, remote and island areas. The look of these areas has seen many changes with higher economic growth and better living standards. Industrial and small handicraft production and aquaculture have all further developed than in the past. Despite this, the changes in trade activities in mountainous, remote and island regions remained slow. Trading and consumption activities were mostly done in small-scale and spontaneously while the commercial infrastructure remained weak and insufficient. In the context of globalization and international economic integration, the market in mountainous, remote and island areas has lagged far behind compared with other markets as it lacked a linkage with the domestic and international market. At the workshop, participants focused on evaluating and analyzing the obtained results and existing limitations in the trade activities in mountainous, remote and island regions. On that basis, they discussed the proposals, offered solutions to support goods consumption and encourage production in the regions. Major contents of the discussions included implementing consumption models of specific goods and specialties of the mountainous, remote and island regions in the domestic and international market; supporting the registration of geographical indications protection and names of origin for these products; building and development unique distribution models in these areas; propaganda and advertisement on trade in mountainous, remote and island areas; improving capability for trade development in these areas and completing policies, mechanisms, planning and strategies on trade in the areas. 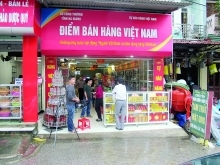 According to Vice Chairwoman of Quang Ngai province people's committee Dinh Thi Loan, the recent trade activities in mountainous, remote and island regions have partly contributed to the GDP growth structure in these localities. However, trade in these areas have only met essential demand like food, foodstuff, oil and gasoline and production tools of different peoples but have not created a strong motive force to promote their advantages and boost socio-economic development. Therefore, developing trade in these areas needs to stick closely to social security issues; goods consumption needs to company with the development of production to increase people’s incomes. Dinh Thi Loan assessed that the draft program will raise new preferential mechanisms which are expected to bring significant changes to trade activities in mountainous, remote and island regions. With the target to develop goods and service distribution systems, the program on developing trade in remote, mountainous and island regions aims at reducing gaps between trade development in remote, mountainous and island regions with others, contributing to boosting socioeconomic development and ensuring national security and defense. The country now has 330 mountainous districts and 22 island districts. Developing trade in these localities is facing a large number of difficulties. The ideas and contributions of the ministries, sectors in this occasion had an important meaning, and was the basis for the MOIT to further complete the program and submit it to the government at the soonest. /.